Focus Investigations is managed by John Kelly, an ex Forces operator who specialised in reconnaissance duties during the 1970’s and 80’s where he gained considerable experience in the UK and abroad. On leaving the forces he joined an international investigation agency where he gained experience and knowledge in the private sector before setting up Focus Investigations. At Focus Investigations the work ethos is all about professionalism and dedication to each task, from serving an injunction order on an individual, to mounting a large scale surveillance operation. We will carefully listen to you to ensure we fully understand your requirements and the needs of you or your business. We then use our experience and knowledge to discuss with you the options so that you can make an informed decision on your future action. We offer a confidential and discreet service, delivered with understanding. We have both male and female personnel. We are insured and Data Protection Act notified. John Kelly is a member of the ABI (Association of British Investigators), BAG (British Agents Group), UKPIN (United Kingdom Professional Investigators Network) and UKPSA (United Kingdom Process Servers Association). A comprehensive range of services for the general public. The solution to your problem could be just a telephone call away. Get in touch today. Contact us in the strictest confidence for a free, no obligation consultation. Make contact today for a no obligation discussion of your requirements and how Focus Investigations can help. A full range of solicitor support services. 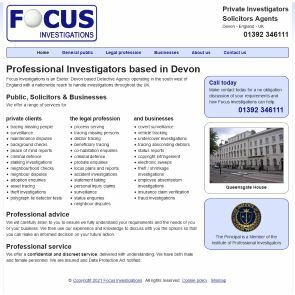 Focus Investigations is an Exeter based Detective Agency operating throughout Devon and the south west of England. If you require services further afield, Focus Investigations are able to utilize and manage tried and trusted associates throughout the UK and abroad. Please tell the company they were Found @ Find a Detective.